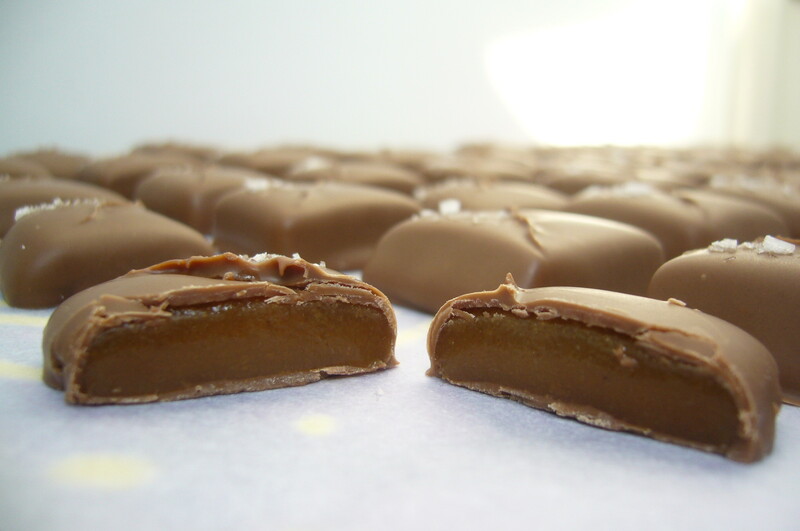 Mou is a fancy French term for a soft, yet firm caramel (it actually means ‘soft’ in French). One that you can pick up and hold, yet still sink your teeth into with ease. I’ve been lucky enough to have been asked to make some chocolates for a big family event next week, for 150 people. Wowzers. Everyone loves caramel, right? 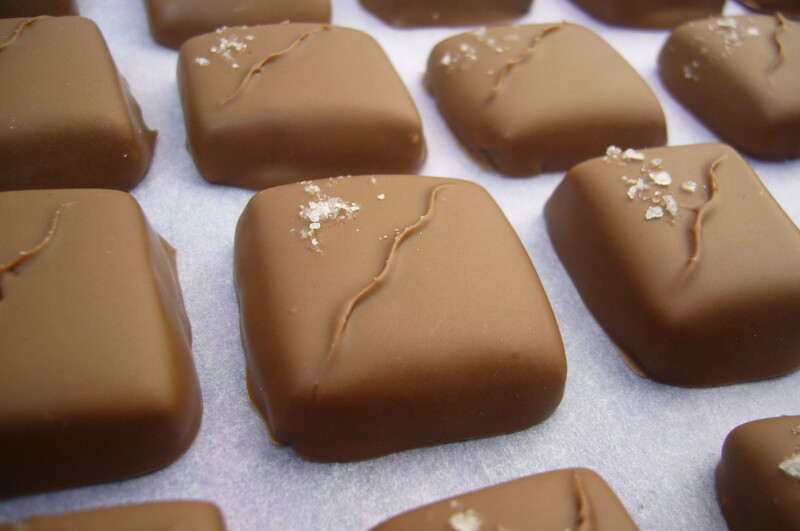 And sea salt caramels are pretty hot right now, so I thought a sea salt mou would be a good choice as one of the flavours. So here they are, my successful second batch. They are covered in a milk chocolate from Costa Rica (which has complementary caramel notes), decorated with a tiny pinch of sea salt and a wave. I had a lot of fun dipping and decorating these – there’s something really satisfying about putting the final touch to your work. These little moux are soft, sweet, salty, chewy, melty and a little mellow. Everything you could want in a caramel. You’ve done it again! The photos you keep posting of your delicious-looking bonbons are, themselves, too delicious, and therefore very distracting. Perhaps they should come with a warning: “Viewers are warned that the following pictures contain flash photography and / or highly tempting & visually exciting digital reproductions. Chocophiles of a susceptive nature should only view them from a distance of at least 10 metres”. These are amazing Steph! Best caramels I may have ever tried in all honesty.